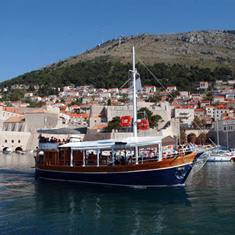 The boat is intended for one-day excursions in the local waters of Dubrovnik from Cavtat to Ston, and it can land in all little ports of the coastal area and Elaphiti Islands regarding its size and draught. This large and luxurious boat is the largest RIB of the best-known RIB manufacturer Zodiac. It is extremely elegant, practical and functional. It is arranged in order to serve the purpose of day excursions: swimming and sunbathing. 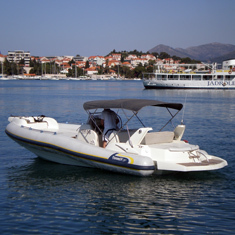 This is medium size speedboat Ideal for crusing arround islands in shallow water. New model in his class very confotable for 6 passengers and skipper. 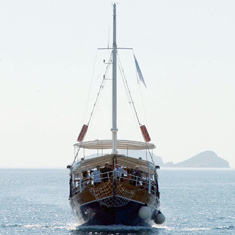 There is nothing like the beauty of the open sea on a tranquil day in the Dubrovnik water. Our fleet affords our guests the option to relax on the reefs, fish, snorkling, or simply cruise the clear blue-green waters of the Adriaic. 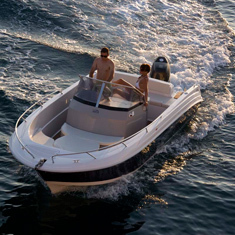 All boats feature center consoles and Bimini tops and are well-equipped with all maritime safety requirements. We organize excursions with small groups, stopping at remote locations, away from the crowds, with attention to the nature and the authentic culture. We operate our own boats and we own the picnic spots where we stop. Quality and personal attention are guaranteed. 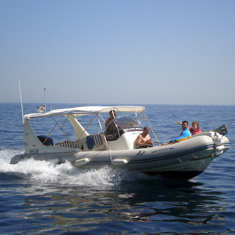 All of our excursions are guided with englis spoken skipper. In the immediate vicinity, northwest of Dubrovnik there is a archipelago named Elafiti islands which consists of a several bigger islands and numerous smaller islets and reefs.